A minus sign means that this term is excluded. Press the thumbs button twice to make a term optional (shows in parentheses). Press it again to make the term required (default). Use asterisks when you're looking for a range of similar words, or are uncertain how to spell a word. For example, the keyword MUPPET* catches the "Muppet Movie", the "Muppet Show" and "Muppets Take Manhattan". Suggestions appear in their own folder now so they don't clutter your own recordings. I don't remember this being an option on the HR10-250 TiVo. 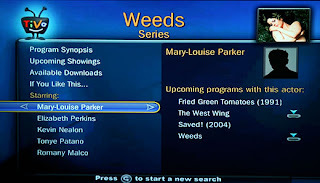 This is TiVo's version of a "unified search" - more like the HR-series search but providing deeper results. Swivel search requires an Internet connection and looks across all accessible video, including upcoming programming, on-demand, and available downloads. 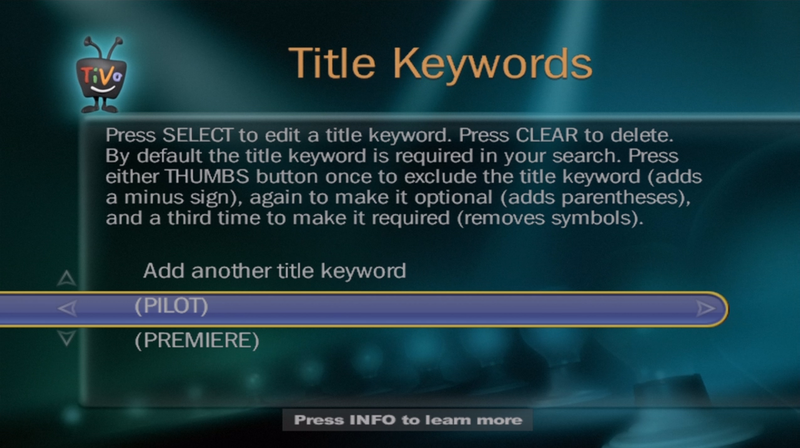 TiVo calls it Swivel search because you can "swivel" off the results. For example, drill down into the cast, then pivot on the actor, and see other TV shows and movies they're in. Swivel Search finds programs that match the text entered. Like a WishList, the results include more than just title matches. Even better, it's a live search, narrowing results as you type. I'm sure there's more in this new TiVo that I haven't found yet, but these are a few of the cool new features making it more than just a direct copy of the previous DirecTV TiVo.